Gir National Park : Gir National Park to Diu & Somnath | Horn please, OK? Gujarat's ever-changing landscape never fails to surprise. Its hard to predict what to expect around the bend. For instance, we didn't expect a multi-headed palm tree. With a day of wildlife spotting under our belts we decided to tackle Gujarat's beaches next. The 95 km drive from Gir National Park to Diu via Kodinar-Dhari highway takes 1.5 hrs. Its the shorter and better route. The Una-Talala highway is longer and much more scenic. No prizes for guessing which one we took. Driving through Talala village we noticed groups of people with distinctly African features. They belong to an ethnic group called the Siddi, descendants of people from Southeast Africa. If you believe Wikipedia, they were brought to India as slaves by the Portuguese back in the 17th century. Heading south towards Diu we found an interesting addition to the topography. Thickets of multiple headed palm trees.They're called Hokka and are indigenous to the northern half of Africa. We think there maybe a connection between the Siddi and the Hokka tree but don't quote us on it. A popular holiday destination mostly for folks who can get there by bus, the union territory of Diu looks like a movie set with freshly painted, rainbow colored walls and roads lined with healthy looking Hokka trees swaying in sync. This perfect set-like aura was brought to life by the hordes that had descended upon the little town on a Sunday morning to get their fill of beer, sun, sand and seafood. Diu is an island separated from the mainland by a skinny river. It was a Portuguese colony till as recently as 1961, 14 years after the rest of the country won its independence. Portugal today has a provision that allows Diu residents (and all other former Portuguese colonies) to apply for Portuguese citizenship. Such sentimental folks. Can you imagine what would happen if the British did the same? Diu has a few famous beaches and Ghoghla isn't one of them. That's what keeps it clean and empty. The Diu Fort and St Paul's Church are this sea-side town's contribution to historical places in India. Coincidentally the Diu Fort and Bom Jesus Basilica in Goa, also a former Portuguese colony, were nominated for Portugal's list of '7 Wonders from Former Colonies'. Did they make it to the list? If you find out, let us know. The fort sits perched on the southernmost point of the island and is quite unremarkable. With no guide to give us a historical lowdown, we sauntered about its vast grounds trying to eke out a story. We found wells and cannons and lookout points. Unfortunately that's where the story ends. Apart from a single tablet at the entrance there is nothing else that reveals anything about the fort. 2 kms from the fort's jetty, floating on water is the Fortim do Mar or Panikotha. Shaped like a submarine/ship its made of stone and looks newer than the fort. It can only be reached by boat. The sapping heat made our decision to skip the boat ride an easy one. The winding roads of this candy-colored town led us to the Church of St Paul. A sight in white on that hot afternoon. The facade is heavy with detail and is an excellent subject for photography. The interiors of the church though, could do with a coat of paint and some natural light. It was getting close to lunch time and Nagoa beach was where all the action was. The drive from the church to Nagoa is along a beautifully wide and curving road that hugs the coastline. A fringe of Hokka trees creates a natural barrier between the road and the beach. Like many beaches in Goa, Nagoa is lined with shacks that sell food and booze. A sight fairly common to beaches in India greeted us. Throngs of boys and men having a good time with not a single woman among them. We skipped the shacks and headed to Hoka 'Resort' rumored to have the best seafood in town. That rumor is true. The service was slow but to their credit they warned us about it while we were eyeballing the menu. They'd read our minds, we wanted to order everything on it. Whatever you do, order the lobster. And she was born a vegetarian. Diu's beaches may not figure in the list of best beaches in India but their small-town tranquility and relative anonymity are what make them special. Diu has a couple more things to see like a Shell Museum set up by a formal naval officer and the Zampa gate. We chose to skip them and drive on to our next stop. Somnath Temple. The temple is about 80 kms away from Diu and is famous for standing the test of time. It is said to have been destroyed more than 7 times by various invaders and rebuilt on the same spot every single time. More than anything else its a tribute to resilience. Travel tip : If you plan to enter the temple, make sure your legs are covered. You'd also be better off leaving your camera and phones in the car. I don't think the Gods give a hoot about what you wear but the gatekeepers at Somnath take their jobs very seriously. 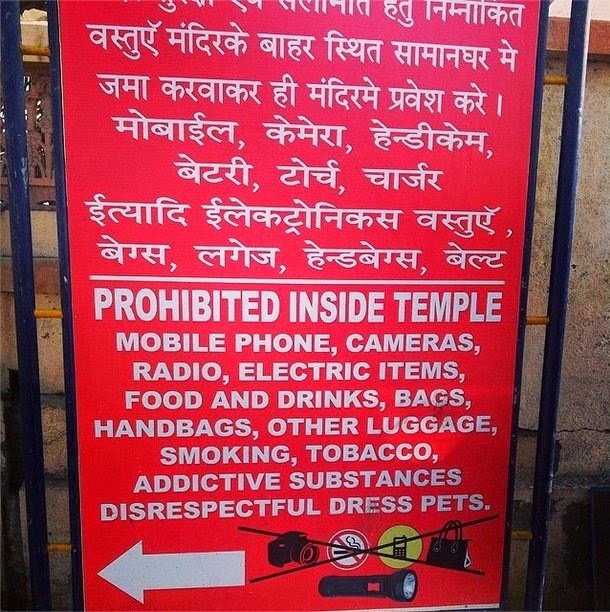 Cameras weren't allowed inside the temple so you'll have to make the trip yourself to see what it looks like. Our advice? Be a respectfully dressed pet.